Walmart is a big department store with really good prices. Just for kicks I decided to go have a look. I saw a pair of peep toes 5 inches heels that seemed nice. I was also able to find a size 10. Tried them on right there, with an older in the alley. I know she gave a glance but nothing else. The shoes weren't too bad and comfortable. I also have pictures but didn't extract them yet. In the next alley were the boots. 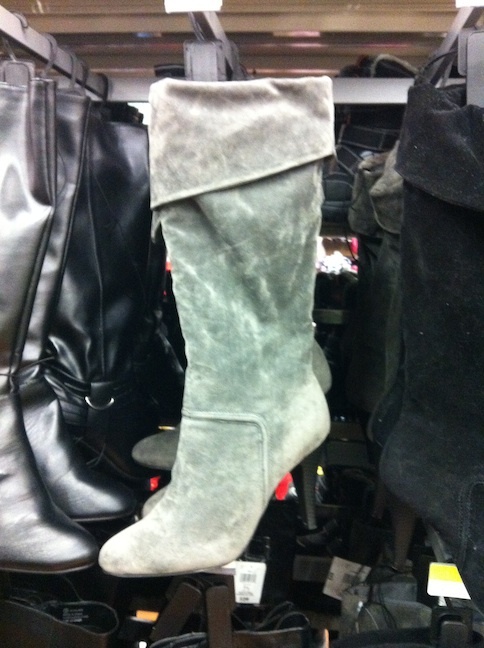 A nice over the knee suede like black boot with about a 3 inch heel. Also found a size 10 (and an 11). I was able to get the left foot on but for some reason the right foot was too tight. Should've tried the 11 after all. As I removed the boots, I saw another model of black, about 4 and a half inches sandals. As I put them on, a young mother and her daughter came in my alley. I was nervous but continued to put the sandals and took a few steps. These were not that comfortable. The mom gave a few discreet glimpses as she passed by me but no idea about the girl as she was behind me when I walked in the shoes. Finally, I tried another model, no pics though, that was really pleasing to my eyes. an open toe with kind of a strappy-mesh like pattern. These were very nice and comfortable. Just as I removed them a group of 3 teenage girls came in my alley. They didn't see. Not sure of teenage girls reaction plus they all had their cell phone. I wouldn't want pictures of me in heels on the web, at least ones where I can be recognized. Just as I removed them a group of 3 teenage girls came in my alley. They didn't see. Not sure of teenage girls reaction plus they all had their cell phone. I wouldn't want pictures of me in heels on the web, at least ones where I can be recognized. My No.1 and No.2 heeling fears wrapped up in one situation. Potentially abusive teenagers and video/pictures published on the Internet. Finally, I tried another model, no pics though, that was really pleasing to my eyes. an open toe with kind of a strappy-mesh like pattern. These were very nice and comfortable. You must have some considerable will-power. Finding myself in an identical situation, I'd have left the store $25 poorer and one pair of shoes richer. Indeed, cell phones with cameras are everywhere now. The only thing that stopped is my wife. Doing me best to share my experience. Glad you liked it. Thanks for sharing your experiences Ludovic. I've only tried womens shoes on once in a shop and they were flats. My wife wasn't happy then. As for the phone wielding schoolgirls, you can already here the giggling and "eeeeewwwww's" as they showed their friends the pics if they'd got them. Not to mention the "LMAO" on Facebook et al. Not a great way to announce your secret to the world. Finally extracted the pictures from my phone... 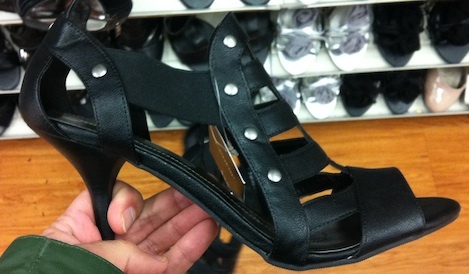 Here are one pair of the heels I tried. I was tempted, but then would I actually wear them, mindful of their price? Good to see some piccies. I'm less of a shoe/sandal guy and more of a boot [ankle boot/bootee] kinda fella. Consequently ..... I'd have been interested to see you in the grey boots shown in the mirror on the floor? 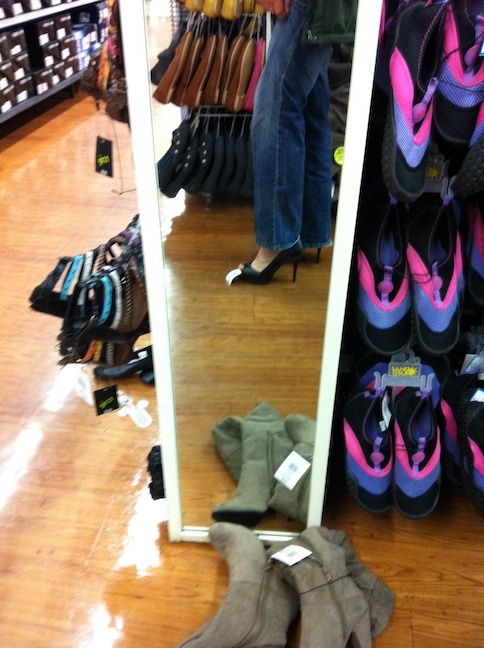 Sorry to be so ungracious..... You are to be admired for having the courage to try any shoe on in public. Well done you! Reason for edit: Link added. I went back to the store, but at a different location. They have short benches to sit down and put the shoes, one per alley. However, not all alleys have mirrors. The one bench with a mirror just beside it was occupied by two girls of about 17-18. They had a pile of shoes... It took me a lot of time to gather up the courage because they were also a lot of people around, but I decided to go through it. I had two pairs I wanted to try. I took the bench next to the girls but still about 12 feet away. I removed my shoes and thick socks and put on the first pair of heels, a 5 inch peep toe in a gray shade. The alley in front of my bench didn't have any mirrors, the next alley towards the girls had a mirror but at the other end, about 25 feet and with a lady and her man just beside it. The only possibility, the one next to the girls. The first girl was on the bench, the other in the second alley. I'm beginning to sense you are becoming a bit of an adrenalin junkie? "What a ride?" It's pleasing to see you getting so much out of what [for women] is such a simple event. Had my heart in my mouth while reading, so quite exciting for me too! Go Ludovic! Thanks for posting the pic of the booties. There is something very attractive about them, possibly the open toe that is calling out to me that I have to have them. And thanks for relating your shopping experiences. I have observed some lifted eyebrows from people that apparently think that I should not wear a heel because of my reliance on my crutches. But in many cases from what I have seen, I am far more adept in a heel with my crutches than she is on two good legs and in heels. Every day when I slip into a heel I feel a thrill mainly because I still am able to exercise my love of wearing a heel and my ability to move aboout gracefully in one. Yet another location this morning. It was somewhat quiet and only a few female customers walked by. 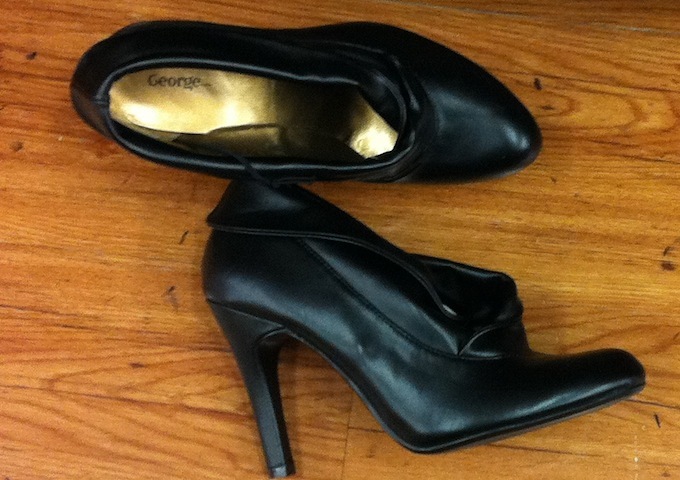 The salesclerk barely glanced at me let alone the shoes I was trying on. There was one older woman though who asked a question to the salesclerk and then saw me with the grey boots on. She said "Oh my God" but that was it. For the pictures, picture 02, was the first pair I tried in a previous post on this thread. Very comfortable. Picture 03 was quite high and the style was lovely. Would be great with some jeans. Picture 04 had a very low heel and felt a bit weird to with after the previous pair. It felt like the heel was absent. Picture 05 didn't fit so well, it was a bit tight and I actually had a harder getting the left on. They are just below the knee. There was one older woman though who asked a question to the salesclerk and then saw me with the grey boots on. She said "Oh my God" but that was it. Once at Marks and Spencer [with Mrs Freddy], I sat next to an older lady in the shoe section. I'd just had herself try on some quite high heeled sandals, only to be disappointed by her comments they were so poorly designed they felt dangerous. Marks are known for their build quality [with price to match] and range of shoe sizes..... So I was a bit cynical about her comments ...... They had my size, and despite the lady sitting next to us, I tried them on. 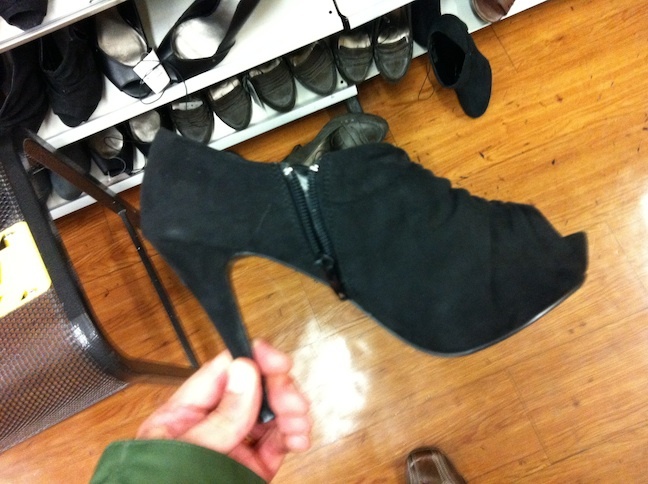 Mrs Freddy was right; they were hard to walk in as the heel wanted to slip from underneath your foot. But interestingly, the lady sitting next to Mrs Freddy remarked [while I tried on the shoes] 'They're lovely aren't they?". Mindful she could have said nothing, it was quite a pleasant thing to say, and a short but good natured chat between us three about the shoes followed. I guess the moral to the two respective experiences is: 'it takes all sorts'? 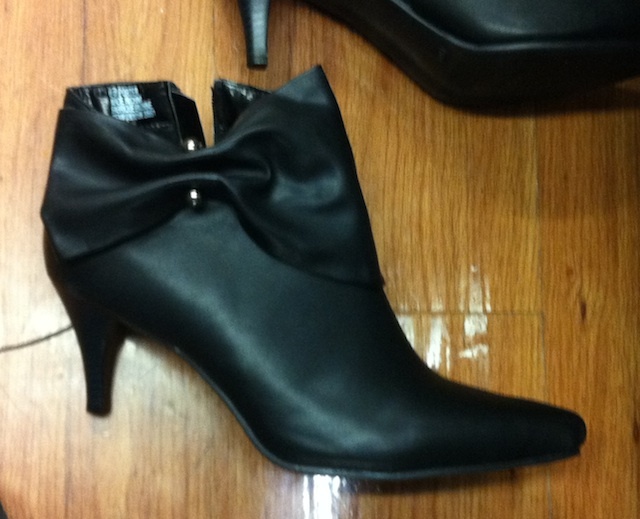 As for picture 03 [if I have the numbering right], the courts with cuffed heel ......... Love them! I have observed some lifted eyebrows from people that apparently think that I should not wear a heel because of my reliance on my crutches. But in many cases from what I have seen, I am far more adept in a heel with my crutches than she is on two good legs and in heels. Every day when I slip into a heel I feel a thrill mainly because I still am able to exercise my love of wearing a heel and my ability to move aboout gracefully in one. The thought of you getting around in an attractive heel, isn't exactly an unpleasant notion. Keep up the good work.